It’s 10 minute decorating time again, friends. On today’s docket: mason jars filled with dried lavender. I have the privilege of decorating my brother’s upcoming rehearsal dinner and wedding, and since the rehearsal dinner is outside at a nature sanctuary, rustic elegance is the name of the game. But beautiful, of course. Because quick and budget friendly doesn’t have to mean you have to settle. 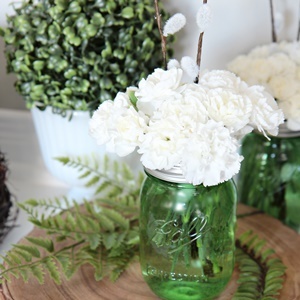 And I thought these little centerpieces were the perfect thing for 10 minute decorating with mason jars. I love dried lavender because… well… it’s dry (i.e. maintenance free!). But it still smells good. And it doesn’t look dead. 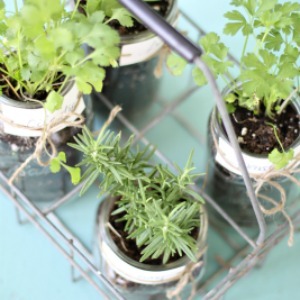 So grab some dried lavender and mason jars and have some fun. If you want to add embellishments to your mason jars, go for it. Tie a ribbon or use a little hot glue. It will peel off pretty easily when you are ready to remove it. Consider adding other dried greenery. 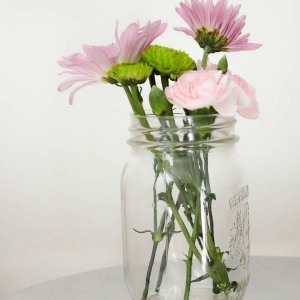 Or use a little mason jar inside a larger one if you want to add some inexpensive fresh flowers. I also love grabbing a bunch of fresh herbs, like this rosemary. I added a few sprigs of the dried lavender, too, for a pop of purple. Dried lavender buds make an excellent filler, too. Put them around candles or use them as a base for other greens. You can’t really go wrong, can you? Though I will be using these for a wedding, they would be beautiful in any home: put them on your mantel, your kitchen counter, your dining room table… Anywhere! Oh these jars and lavender are a perfect pair. LOVE putting the lavender in the bottom of the mason jars. It really hides the stems. What a gorgeous idea for a wedding! They’re all just SO pretty Rachel! Beautiful inspiration! These are just beautiful and are going to be perfect for the rehearsal dinner. I love all the buds too, have fun! Such a gorgeous centerpiece – I can almost smell it! This is a lovely idea! Simple, fast, and pretty! Gorgeous! Perfect for an outdoor rustic wedding Rachel! 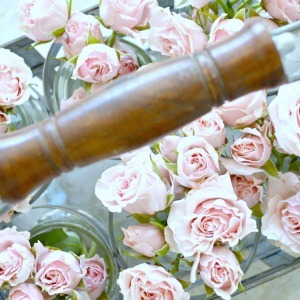 I love the soft colors and bet these arrangements smell amazing! 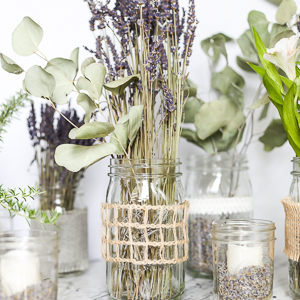 Love your ideas for the dried lavender, especially the candle jars. That is so easy and will smell so great. Really cute! I am thinking of doing something similar for my wedding. I see you used a fake candle. 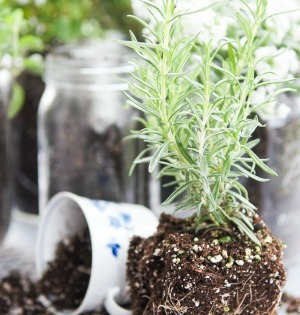 Do you know if you can use a real candle on top of tried lavender buds – is it safe? I know the wax will definitely melt onto the buds throughout the reception, but I can’t help but think that dried plant matter is still flameable. Maybe I should also use a fake candle.. Thank you! And great question. I actually used real candles at the wedding (you can see more of the evening here), and while the wax melted into the lavender buds and made a huge mess, there were no fires. I figured that the mason jars at least protected the tables! But don’t take my word for it. Try it yourself and make sure you ask your wedding venue about their rules for open flames. Congratulations on your upcoming wedding!!! Hopefully you reply to this since I’m stealing this idea for my wedding…but how much lavender flowers did you use to fill mason jars? 1 pound, 2? I’m so sorry, I just saw this comment… and I don’t remember how much we used! I wish I were more help. Congratulations on your wedding, though!